What is this Śama? The author of the Tattvabodha says, mano nigrahaḥ. What does mano nigrahaḥ mean? They will generally translate this as mind control, or mind destruction—as though the mind needs to be destroyed. Anyone who wants mind destruction is already destroyed, otherwise, why should he need mind destruction? His whole thinking is destroyed, so he wants to get rid of his mind. Mind baiting is the biggest thing in the world; it is big business also. The mind is just the most beautiful instrument that the human being has. Everything else, every animal has. In fact, they are better equipped. A police man takes the help of a dog. He is called a sleuth but he is not; that dog is the sleuth. All other animals are better equipped than humans in certain ways. Consider a bat. It can fly in the night. People think it is able to see in the dark, but it doesn’t see anything. It just goes on squeaking and sending out sounds which rebound. And it is able to interpret those sounds and detect an obstruction while in flight, and guide its way. It is all sonar. It can also detect fruit in this way, and distinguish those sounds from the sounds that signal a leaf. And it can distinguish whether a piece of fruit is ripe or not, and go after it. What a thing it is, this bat! There is so much research going on about it. These animals are so much better equipped than we are in so many ways. The only thing that makes you someone special is this great mind you have. It is not an ordinary thing. There is nothing wrong with it, as long as you don’t say that there is something wrong with it. And if you don’t say it, but have the feeling that there is something wrong with it, which is the worst thing to do. The mind is an angel being. It has to be used; it is meant for use. People really manipulate people only through the mind. Therefore we have to analyze this properly. One has to pay one’s attention to one’s mind. The mind is just the most beautiful instrument that the human being has. It has to be used; it is meant for use. It is taken for granted, nor should it be looked upon as something that causes real problems. Mainly, the mind is meant for knowing, remembering, and also to entertain emotions. The mind is the seat of emotion as well as the seat of knowledge, so there is an emotional mind, a cognitive mind, and also, a recollecting mind. And because it is instrumental in knowing, it is called an instrument, karaṇa, the inner instrument,-antaḥ-karaṇa. It is necessary for knowing; without the mind, an individual, cannot know, so it is called a karaṇa, instrument. The eyes are also a karaëa, a sense organ, which enables us to see colors and forms, and so too, the ears are a karaṇa. But the eyes and ears and other senses cannot function by themselves, without being backed by the mind, so the mind is also looked upon as a karaṇa, a means. You are able recognize something only with the help of the mind. Now, what is it that really bothers a person? In a bothered person, it is the person that is bothered, really speaking. It is not the mind that really bothers, but the person who is bothered. And in this, the mind seems to play a role. In which way? In creating certain emotions, like fear. But fear is for the person, not for the mind, please understand. The poor mind is unnecessarily being attacked. It is the person who is afraid, and therefore, there is an emotion called fear, and similarly, anxiety, hatred, and so on. And there are also emotions like, love, compassion, empathy, and so on. These emotions also manifest in the mind, and again, only reveal the person. Compassion only reveals the compassionate person. The emotion ‘compassion’ is for the person who is compassionate. We should always include the person, understand, otherwise, the mind will become the whipping boy for all our problems. It is just me, viewed from the standpoint of the mind. So whenever the śāstra deals with the mind, it actually deals with the person with reference to the mind, that’s all. It deals with ‘me’ the individual, who, with reference to an emotion called compassion, is compassionate. And because I am compassionate, there is compassion; because I am loving, there is love. It is not that because there is love I become loving, or because there is fear I am frightened. It is, rather, because I am frightened, there is fear; because I am agitated, there is agitation. I am anxious, therefore there is anxiety; I am hateful, therefore, hatred. Why do we separate this mind from ourselves and then whip it unnecessarily? Does that mean I have to whip myself now? No. I am what I am, again, because of certain laws. And therefore, whenever we talk about the mind we have to be really responsible. Whoever talks about the mind must be highly responsible, because he or she may create problems for others. It is very easy for us to conclude, “My mind is no good at all.” There is no such thing as a bad mind. The mind is always good; it does anxious, it presents anxiety for you, but that doesn’t mean that the mind is bad. It is not that your mind is something special that gives you anxiety. It is not a mother-in-law; it’s just you. You are the person, the affected person, etc., but still, the mind gives you an indication that you need to pay a certain attention. This paying attention is called Śama. I need to learn to deal with all these situations, which the mind reveals, like anxiety, depression, anger, especially anger that it is not warranted at all. The situation doesn’t really deserve such anger, so if it is there, I must understand that it is the person, the already angry person, who manifests himself in the form anger. But it is the mind that really tells us exactly what is going on, and therefore, the mind is pointed out in mano nigraha. The mind, not the person, is One has to pay one’s attention to one’s mind. It cannot be taken for granted, nor should it be looked upon as something that causes real problems. Through the mind alone we understand the person. Thus, we have varieties of emotions which are not liked by ourselves, or by anyone. I don’t like myself being angry; I don’t like myself being, anxious, frightened, etc. But then, I am. So how we are going to gain a resolution of this? There are so many methods. People follow various means, but one thing that is common in all of them is that you have to accept the emotion. If I am frightened, I have to accept that I am frightened. Thinking that I should not be frightened is not going to help me. Or, that I should not have been frightened. That doesn’t help me either; it is even worse. Therefore, ideas such as “I should not be frightened, I should not have been frightened,” only confuse the whole situation. And these kinds of confusions are promoted all the time by the so-called spiritual teachers. At the same time, I do need a mind which is more or less abiding, understanding that the mind is an indication of me alone. I need a mind that is available for my understanding, for my pursuits, for my contemplation. Such a mind must be available for me. This ‘availability’ is exactly what is said here. Otherwise, there is no necessity to specify all this. When you apply for admission to a school, they don’t ask, “Do you have Śama, do you have dama?” All this they are not going to ask. They just ask you, in effect, “Are you ready for this?” If you have done your B.Sc., then you can join the M.Sc. program; that is all. This is adhikṛtasya adhikäraḥ. If you have completed your undergraduate studies, then you can do post graduate studies. It is so simple. They don’t ask for anything else—like Śama, dama, uparati, titikñä, çraddhä. Here, however, the subject matter is me. Understand the difference. The subject matter of Vedanta is me, and because it is me, this ‘me’, the individual, has to deal with himself. And the emotional person is a very important person. You can’t bypass emotion. You can’t bypass anything. You cannot bypass the world, you cannot bypass your body, you cannot bypass your mind. There is no bypassing at all in this. Even if you try, you cannot bypass anything here. It is like creating a bypass road, in order to avoid congestion. On the city roads there are shops on both sides, so it is a problem to go through the city, and therefore, they create a bypass.Then what do they do? On both sides they again allow shops, and the problem remains. So too, here. It is exactly like Indian road bypasses. If you bypass something, there, exactly, there will be a problem. So you are not going to be able to bypass anything. We don’t want to bypass any reality. Whether it is subjectively real or objectively real, there is no bypassing of anything, understand, no bypassing. When you deal with yourself you can’t bypass. Only in heart surgery is a bypass allowed. Nowhere else, because there, bypassing is dealing with a problem. You are not bypassing the problem; you are bypassing to solve the problem. But here, we don’t bypass anything. 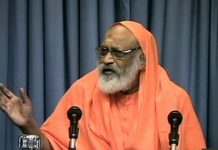 In listing the things that we cannot bypass, the author of the Tattvabodha only points out the qualifications of Śama, etc., but does not tell what are the things that will give you the qualifications. Those we have to discover in our study of the Gītā, etc. One thing I can say here is that Śama is a resolution of the mind. But resolution of the mind does not mean that the mind becomes like blank paper. It is, rather, the mind that is available for you. Nothing more; don’t add anything more. It is just available for you. When Emotions that manifest in the mind only reveal the person. . . So whenever the śāstra deals with the mind, it actually deals with the person with reference to the mind, that’s all. you sit in contemplation, it is available for you, when you study it is available for you, and when you are sitting and listening to me, it is available for you. When it is available for you like this, why do you bother about the mind? The mind is serving you. It is available for you, cognitively. Sometimes it disturbs you too. It looks like it disturbs you, but, in fact, it is already a disturbed mind, and it wants to get rid of the disturbance, the old disturbance. So it comes in the form of the disturbance that needs to be released. It comes in the form of fear, because there was a fear locked up underneath, and that fear gets released. We have to understand these kinds of situations very clearly. That fear you can look at now as a fear released, rather than a fear gained. You can look at it as an anxiety released, rather than an anxiety gained. You can look at it either way, but if you look at anxiety as a new gain, then you are going to conclude that you are anxious, and nothing is happening. In fact, nothing needs to happen; let the old anxiety go, let the old pain go, let the old hatred, jealousy, whatever is there underneath, let it all go. They are more going than coming, especially when you are addressing the problem. When you are not addressing the problem, you don’t know anything at all. When you are depressed, you are just depressed. 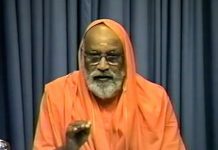 Here, when you are addressing the problem, you are looking at yourself, because you are the prime subject matter in the study of Vedanta. Naturally, whatever is there will come out. And the more I am able to look at all of it, with a sense of surrender, the better. Surrender to what? Surrender to the order, the order which includes psychology. That order is Īśvara, as we will see later. And therefore, through our prayers, through our meditations, through our japa, through our duties, and anything that is necessary to nourish ourselves, we take care of the mind. We deal with this as we proceed, all through the course. Śama, then, is the availability of the mind for you to proceed. That’s all it is: śamaḥ mano nigrahaḥ is—the availability of the mind. It is mental time. Physical time may be available, but mental time may not. If mental time is available, then physical time will accommodate that, always. Mental time is something that is not usually available for people, because the mind is too busy. And so, the resolution of the mind is taken here as a qualification, Śama. This is where the religious life comes in. Originally, in a structured religious life, this was easier. One who has a religious life has found a certain bonding with Īśvara, and that person can relax. Thereby, the person finds a certain resolution. It is purely by devotion, by bonding with Īśvara. We will analyze all that later. You can see that this is a very responsible topic, a topic that has to be dealt with very sensitively and understood properly. Śama is defined as mano nigrahaḥ, but there is no mind control. Nobody controls anything, understand; this idea of mind control is nonsense. If you attempt to control the mind, you will find smoke coming out of your head. Therefore, this has to be understood very thoroughly. I find that this is one topic that is dealt with very irresponsibly by a lot of people who present themselves as knowing everything. Unasked they are giving advice and using the mind to manipulate people. 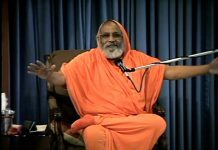 One person who was supposed to be a teacher, wrote to a person who was some kind of a disciple, Śiṣya, saying, “Have a pure mind.” What does it mean? What do you mean by “Have a pure mind”? I don’t understand this at all. And this was advice that was not asked for. When you give advice, unasked, you are trying to manipulate the person, trying to keep the person under your control. You put yourself on a pedestal, implying that you have a pure mind and the other person should have a pure mind. This is just ridiculous. What is that pure mind, please tell me? Is it Here, the subject matter is me. . . ., the individual, who has to deal with himself. And the emotional person is a very important person. You can’t bypass emotion. You are free from gray matter, or white matter, or what? It is all manipulation, nothing but manipulation. And therefore, it is irresponsible, making people mediocre, just to keep them looking up to you. Once you say, “My mind must be like this,” you will be a permanent devotee. Throughout your lifetime you are going to have a mind, and there will always be some problem or the other, so you will be a permanent disciple. And according to the Self Realization Organization, the disciple and guru are reborn again, because one life time is not enough. Neither for the guru is it enough, nor for the Śiṣya, and therefore, they are reborn, it seems. 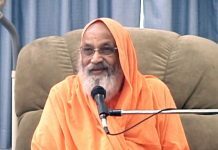 For what is he a Śiṣya? I used to hear that husband and wife are reborn and become a couple again. That is O.K. I like that, because they need not deal with a new idiot, so there is constant growth. This is wonderful, and I accept it very well, but in this guru-Śiṣya relationship, one should not bean idiot. 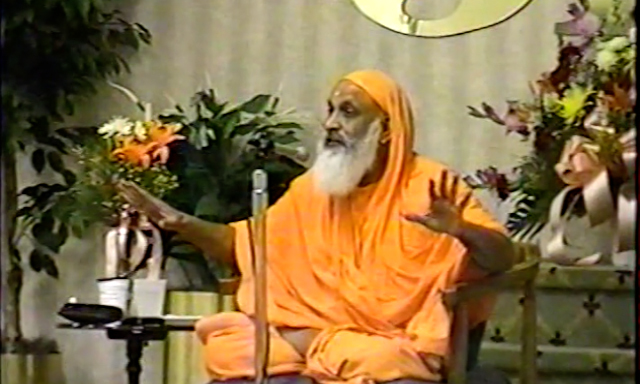 The guru is supposed to be enlightened, and yet they say that he is reborn again and again. It is all manipulation. Śama, then, is the availability of the mind. That’s all it is. This Śama is a resolution of the mind. But that does not mean that the mind becomes like blank paper. It is, rather, the mind that is available for you. Nothing more.